Andre was born in Scarborough, Ontario on November 10th, 1994 and raised in Markham by his mother Beverley, who was a high school sprinter growing up in Trinidad & Tobago before moving to Canada in her twenties. Once a promising basketball player, Andre’s life changed in the space of 10.9 seconds, the time it took him to run his first 100m at the York Region High School Championships in the spring of 2012. Andre was convinced by a friend to give track a try after his high school, Milliken Mills H.S., was unable to field a basketball team in his senior year. So De Grasse laced up a pair of borrowed spikes, donned some baggy basketball shorts and raced to a second place finish without the benefit of starting blocks. Tony Sharpe, himself an Olympic medalist for Canada at the 1984 Olympics, was in the stands that day and immediately took Andre under his wing. Andre joined Sharpe’s Speed Academy track club and by the following summer had set a new Canadian junior 100m record of 10.25 seconds. Living up to the hype swirling around him, Andre swept the 100m and 200m events in dramatic come from behind fashion at the 2015 Pan Am Games held in his own backyard in Toronto, Ontario. Capping off his magical 2015 season, Andre represented Canada at the 2015 IAAF World Championships in Beijing where he tied for the bronze medal in the 100m. This made him Canada’s first world medalist in the event since 1999. 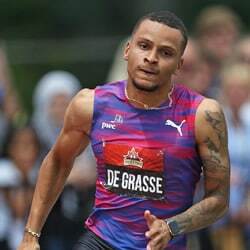 De Grasse ran sub-10 seconds in all three rounds of competition. He was also part of the 4x100m relay team that won bronze. Competing in his first Olympics, Andre De Grasse ran a new personal best in the 100m final in Rio, to capture a bronze medal behind Justin Gatlin of the USA and Usain Bolt of Jamaica. In the semi-finals of the 200m, Andre lowered his own Canadian record running 19.80 before racing to a silver medal in the final behind Usain Bolt. He went on to win his third medal of the Games, anchoring the men’s 4x100m relay team to a bronze medal in a new national record time of 37.64. In doing so, he became the first Canadian to win medals in each of the sprint events in a single Olympics. Despite turning professional and signing an eight-figure contract with Puma, Andre had committed to completing studies at USC after the Olympics and he did just that, graduating with a degree in Sociology in the spring of 2017. Off the track and with the benefit of a growing roster of corporate partners, Andre has established the Andre De Grasse Family Foundation, which is committed to empowering youth to realize their own dreams through access to sport, education, and mentorship. Andre is available for panels & in-conversation events. He can discuss his inspiring personal journey, insights on performance, success mindset, and resilience. From Twitter chats to Facebook live & everything in between, have Andre engage your network to help take your online discussions to the next level.